Rex Tillerson, the former chief executive of ExxonMobil, testifies Wednesday before the Senate Foreign Relations Committee. Tillerson recently resigned after a four-decade career with America’s biggest oil company, allowing him take the top diplomacy job in the Trump administration if senators approve his nomination. Like Trump, Tillerson has no government experience and he has close and controversial ties with Russia. Democrats on Wednesday appeared skeptical of Tillerson, pointing to concerns about climate change and American sanctions on Russia, which have cost ExxonMobil an estimated $1 billion. Most Republicans, which control both chambers of Congress, spoke in support of his nomination. “You’ve led a global enterprise with 70,000 employees around the world, have been there for 41.5 years, have met world leaders, know them up close and personally,” said Sen. Bob Corker, a Republican from Tennessee who chairs of the Foreign Relations committee. He told Tillerson it’s “very possible” that he was an “inspired choice” for the job. ExxonMobil’s business revolves around gas and oil drilling — industries that would be threatened by far-reaching efforts to slow climate change. The company is a major source of climate pollution and it has operated major drilling projects in Russia, Iran and other countries that the Obama Administration views as hostile. The company’s efforts to conceal climate science in recent decades were revealed by InsideClimate News and are being probed by a number of states. More recently, ExxonMobil acknowledged that climate change is real and it stated its support for the Paris climate agreement. Despite his long tenure with the company — and the hundreds of millions of dollars worth of company stock he accumulated during his time there, which he has pledged to sell off — Tillerson repeatedly told Senators he would put America’s interests before ExxonMobil’s. “My love of country and my patriotism is going to dictate that I serve no one’s interests but that of the American people,” Tillerson said. Tillerson briefly shared his own perspectives on climate science several times, describing a scientifically flawed view that downplays the dangers of warming. His views on climate change appear to have evolved in recent decades in lockstep with that of his former employer. Climate scientist Katharine Hayhoe, who directs the Climate Science Center at Texas Tech and specializes in climate projections, said Tillerson’s statement would have been correct more than a century ago — but not anymore. Since the 1850s, greenhouse gas pollution has caused temperatures to rise nearly 2°F, which is raising sea levels and fueling storms, droughts, wildfires and deadly heat waves. A climate treaty finalized during United Nations meetings in Paris in late 2015 aimed to slow the rise in temperatures and eventually end fossil fuel use. Demonstrators protest against Tillerson outside of a hearing room on Capitol Hill on Wednesday. President Obama prioritized global and American efforts to slow climate change during his second term, pushing other nations to strike the Paris climate treaty. The pact relies on countries making voluntary efforts to slow warming. If Trump is true to his words, those efforts will be jeopardized during his presidency. The President-elect has falsely described climate change as a “hoax” and he vowed during the election campaign to withdraw the U.S. from the U.N. climate pact. He has criticized American spending on efforts abroad to slow warming and adapt to its impacts and he has nominated a cabinet dominated by climate science denialists. Tillerson’s opening address on Wednesday discussed terrorism, China, Russia and the Boy Scouts’ pledge but it didn’t not mention climate change or the U.N. climate treaty. 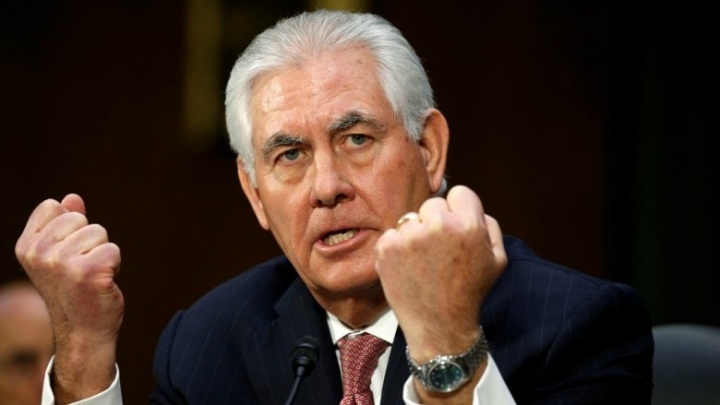 Despite the secretary of state’s role in global climate diplomacy, the issue of climate change was largely ignored during the hearing, apart from questions from Democrats, who expressed concerns that Tillerson would not take climate change seriously. On climate policy, it appeared Tillerson will support continuing America’s involvement with international climate negotiations. “I think it’s important that the United States maintain its seat at the table on the conversation around how to address threats of climate change,” Tillerson said. But when asked directly about the Paris climate agreement, he refused to say whether he thought America should remain a member of the treaty. He also wouldn’t discuss the potential curbing of American spending on climate programs abroad. Tillerson indicated both of those decisions would be made in consultation with Trump. That suggests that the U.S. under Trump’s leadership may mimic George W. Bush’s divisive approach to global efforts to slow warming. Bush ruled out joining the Kyoto Protocol after his election but he continued to send diplomats to climate talks, where they were often accused of obstructing progress. Asked whether he would support a national carbon tax, which is supported by Democrats but opposed by Republicans, Tillerson said tax policy is a consideration for other federal departments. 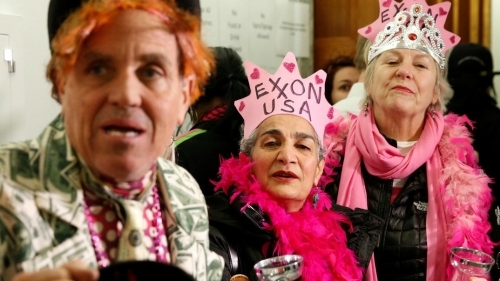 In recent years, ExxonMobil began supporting a modest tax on carbon pollution.